A Russian monarchy romance and politics comedy, A Royal Scandal provides a showcase for Tallulah Bankhead but is otherwise limited in scope and impact. 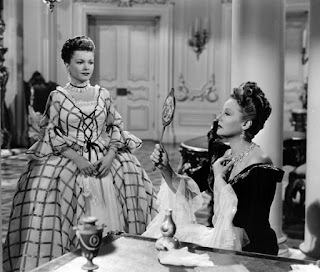 In the court of Queen Catherine of Russia (Bankhead), Chancellor Nicolai Ilyitch (Charles Coburn) has the job of knowing everything about everyone to protect his Czarina. Countess Anna Jaschikoff (Anne Baxter) is Catherine's confidant and chief fashion consultant. With French Ambassador Marquis de Fleury (Vincent Price) waiting for an audience, a breathless Lieutenant Alexei Chernoff (William Eythe), who is also Anna's lover, arrives from the far reaches of the Empire to warn Catherine of a plot against her life. Although it turns out that the Chancellor had that plot well in control, Catherine immediately takes a liking to the dashing Alexei and quickly installs him as her new toy boy and promotes him to lead her palace guard. He is enchanted, forgets all about Anna, and fully falls for the pretense that he is the Queen's closest advisor. With Anna unable to hold her tongue, Alexei has to decide where his loyalties lie when he uncovers a new plot, this time for a palace coup. A play adaptation, with the film produced by Ernst Lubitsch but directed by Otto Preminger after Lubitsch fell ill, A Royal Scandal remains severely stage bound and offers narrow appeal. The fictional romance and scheming shenanigans within the Russian court may have had some basis in reality, but the film makes it difficult to care. Large chunks of the 94 minutes are spent on scenes of discourse between Catherine and Alexei, the action static, the movie trapped within a couple of sets, the pacing slow. On the positive side some of the dialogue is snappy, Catherine in particular provided with the edgiest lines while her Chancellor Nicolai oozes the manipulative oil that keeps his Queen's machinery in control. And in terms of performances, Tallulah Bankhead is a joy to watch as she dances in the space between lonely ruler looking for her latest virile lover and killer instincts to do whatever it takes to maintain an iron grip on the throne. Even in black and white Catherine's stunning dresses and jewellery add much needed visual appeal. Charles Coburn is the other standout performer, but he disappears from the film for long stretches. As for the story, there is some humour to be found in Alexei's rapid series of promotions as Catherine's lust-o-meter kicks in, but otherwise much of the action happens off-screen, with the evildoers poorly defined and confined to tertiary characters with interchangeably difficult names. A Royal Scandal is a generally mundane affair, lacking in cinematic energy, with the romance, laughs and palace intrigue all confined to tight quarters.